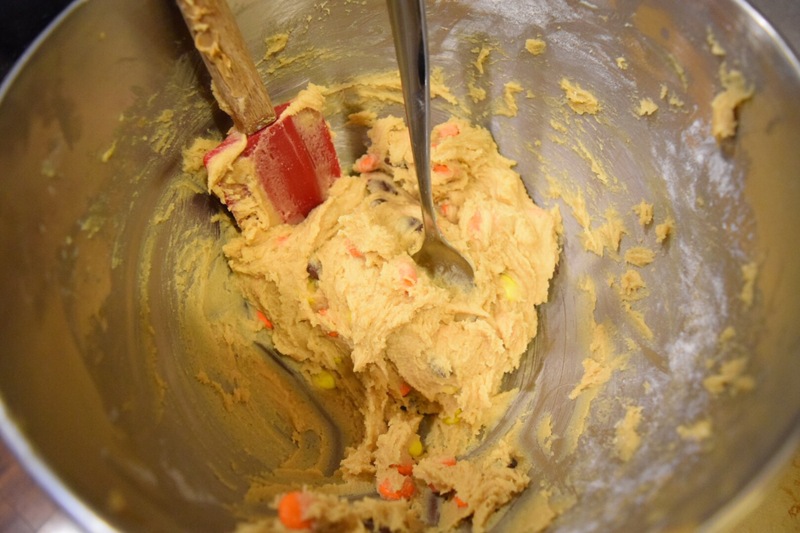 THE BEST Hershey’s Reese’s Pieces Cookie Recipe! – Abbey Co. Kicking off birthday month, I thought it would be appropriate to share a super delicious sweet treat… because what is birthday month other than a time to completely over-indulge?! My personal preference when it comes to sweets is more savory than straight sugar, which is why these cookies are one of my favorites. This is a peanut butter sugar cookie base, but the peanut butter is not overwhelming what-so-ever. Just a subtle hint, with a little bit more flavor coming from the Reese’s Pieces. 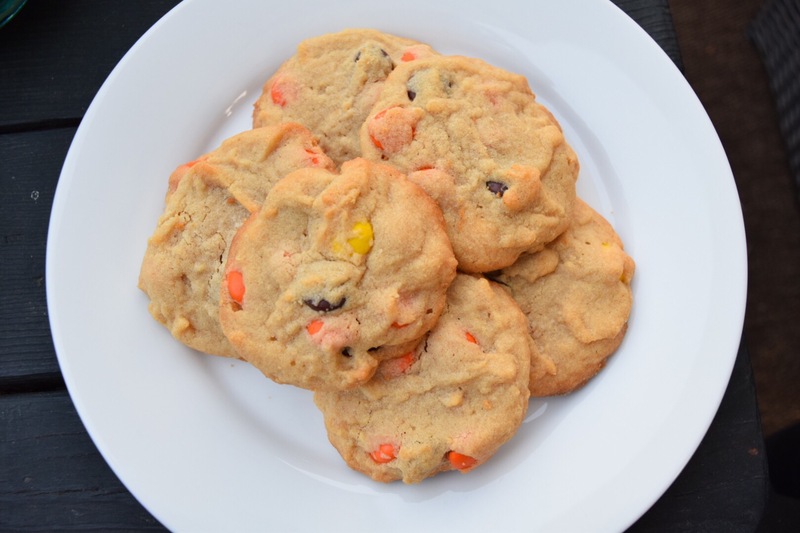 Reese’s Pieces are one of my favorite candies mixed into a treat, whether it be a cookie or ice cream, so I set out to find my favorite cookie recipe including them. To my surprise, I found a “Hershey’s Kitchen” recipe blog, with tons of recipes involving their candies, and it actually is quite good! So, I am sure I will be going back to the Hershey’s Kitchen website for more recipes since I was so pleased with this one. Truly, I give these cookies 5 full stars, and wouldn’t change a thing about them! I think my first time making them I was out of baking soda and used 1/4 teaspoon of baking powder instead, and they still turned out wonderful! Here is the original recipe from Hershey’s Kitchens! 2. Beat butter, granulated sugar, brown sugar, peanut butter, egg and vanilla in large bowl until fluffy. Stir together flour, baking soda and salt; gradually add to butter mixture, beating until well blended. Stir in candies. Drop by heaping teaspoons onto un-greased cookie sheet. 3. Bake 10 to 12 minutes or until edges are lightly browned; remove from oven. Cool slightly; remove from pan to wire rack. Cool completely. Makes about 30 cookies. This cookie dough is so yum, I could have ate the whole bowl! Yum! It is my birthday month, too! 9th! Woohoo, I am the 12th! Happy bday! They are seriously some of the best cookies I have made in a long time… simple but delicious! Pingback: Bye Bye Birthday Month! 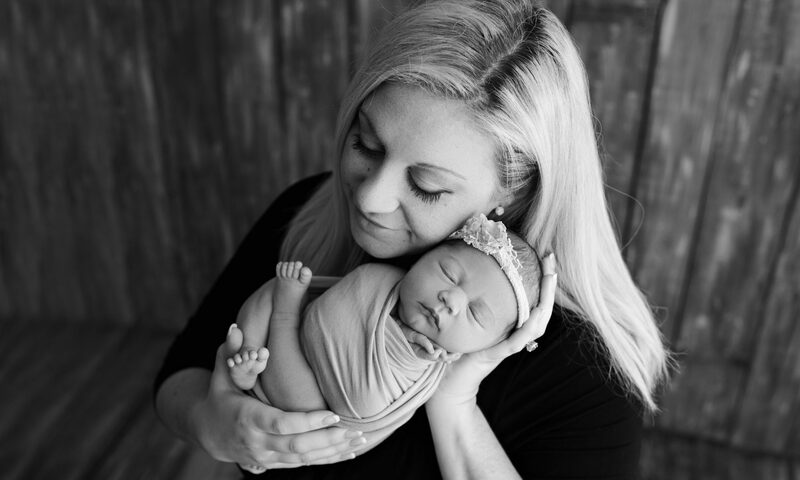 September Recap – Abbey Co.